WinSPC introduces a new way to analyze your manufacturing processes to improve product quality and cut costs. Using this new model, you can search for hidden areas of inefficiency and waste, analyze characteristics to identify the causes of that inefficiency, and justify quality initiatives by quantifying the amount of savings your company will realize with an improved process. Which processes had the most specification limit violations in the past month? Which processes had the most control limit violations in the past month? Which processes declined in capability this month compared to the last 6 months? Which process averages have shown a 10% or greater deviation from target over the past month? Which of the products that ran this week had a corrective action initiated due to a process violation? What actions were taken? What were the causes of the problems? With WinSPC’s search tool, you’re no longer limited to one-at-a-time characteristic analysis. Without using complex analysis tools, you can easily query data from various processes and product lines. 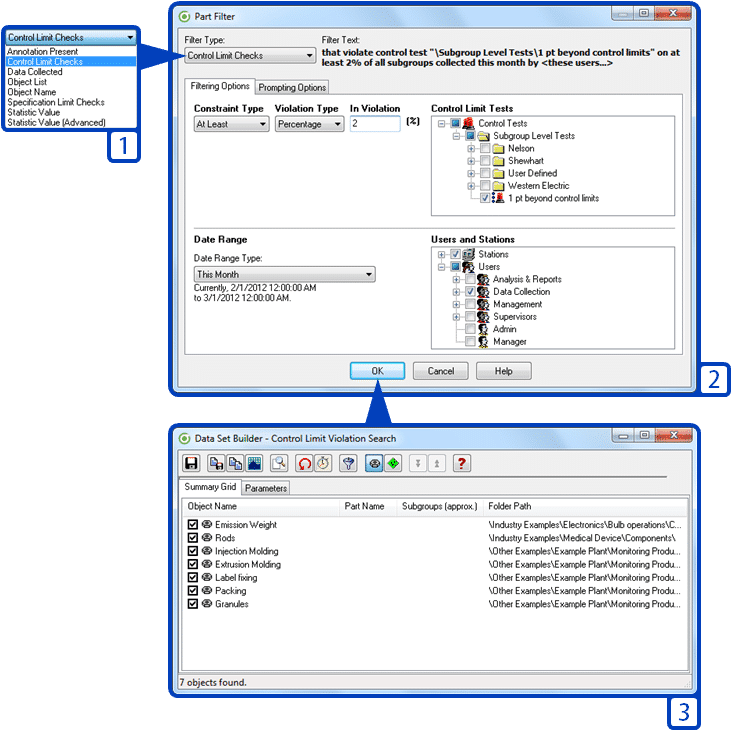 Using straight-forward English language queries and an intuitive Windows-style interface, you can investigate and find answers using common filters and criteria. You can perform searches based on statistical values, date ranges, assignable causes, and more. With WinSPC’s search capability you can find and focus on those issues that are most important to your production and performance. 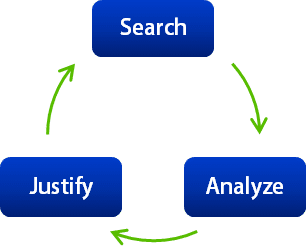 Search: To locate areas of inefficiency, just choose a constraint type (1), define the data you want to search for (2), and view a list of results ready for analysis and reporting (3). Once you’ve identified a trend or inefficiency using the search tool, WinSPC provides a host of analysis capabilities to take a closer look at characteristics and begin to uncover root causes of process problems. You can sort data to compare performance across shifts, machines, tools, and other factors. For example, you could filter data to isolate control test violations or measurements for which corrective actions were entered. Or you could filter data by machine tool and observe long-term trends that could serve to guide preventative maintenance. By simultaneously sorting and filtering data, you can quickly discover clues about underlying cause-and-effect relationships, equipping your quality team with the information needed to fix the right problem, the first time. Analyze: Once you’ve pinpointed areas of inefficiency, first drill down into characteristics (1, 2), then isolate the data you want to examine (3), and sort that data by a constraint (4), such as the machine which produced the unit. In this way, you can investigate how performance is impacted by a constraint. After uncovering issues and analyzing process performance, WinSPC provides you with a tool to identify which process inefficiencies are costing your organization the most. 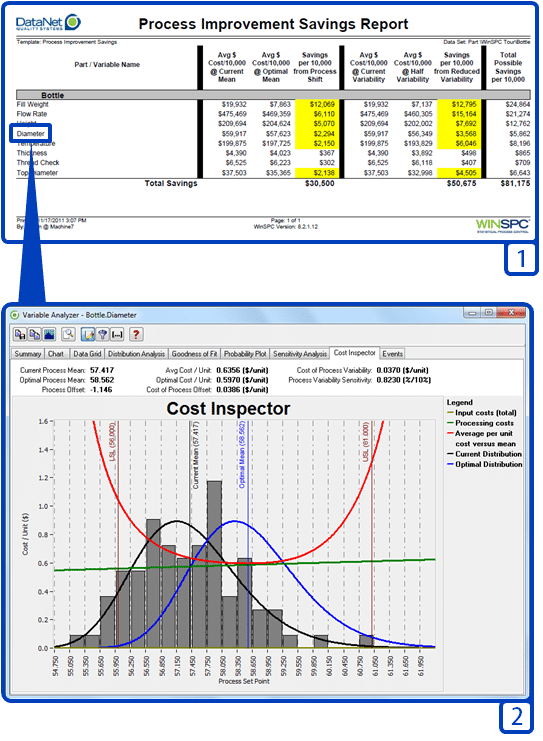 WinSPC’s patent-pending Cost Inspector™ enables you to translate quality information about a process into dollar savings for your company, providing a clear method of prioritization and justification for investment in production improvements. Which processes have the highest cost of variability, that is, the cost attributed to not producing every unit right on target? What process mean would deliver the lowest per-unit cost? How much can be saved by reducing variability or process mean offset by 10%, 20%, or 30%? By harnessing the power of WinSPC’s Cost Inspector, you can clearly prioritize projects and demonstrate bottom-line savings to support investment in quality initiatives. Justify: Report on the potential savings associated with reducing variation and process mean offset (1). Further justify quality investments by viewing detailed cost analysis by characteristic (2).